This weekend, some of our swimmers took part in kit carrying at the Edinburgh International Swim Meet at the Royal Commonwealth Pool. 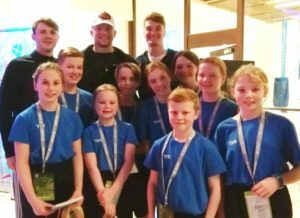 As well as watching some of our own Hearts swimmers, they got a poolside view of top athletes such as Adam Peaty, Ross Murdoch, James Wilby, Hannah Miley and Aimee Wilmot to name a few. During the 50m breaststroke ‘skins’ event, Olympic champion, Adam Peaty paused to ‘high five’ the kit carriers who were cheering him on. At the end of the weekend, Adam, Ross and James happily chatted and took the time to sign autographs. Adam also answered a few questions. Adam, Ross and James happily posed for a photo and thanked all our kit carriers. There were also great performances from some of our swimmers from FaST2 and Elite over the weekend with Holly McGill, Rowan Saunders, Ellie Reilly and Emma Russell making finals. President Helen Reilly was on marshalling duties all weekend and Stuart Russell was transportation manager, taking top swimmers between airport, hotel and pool all weekend. Full results of our swimmers can be found on the results page.